Wheelersburg’s Kaylee Darnell goes up for a layup on Saturday evening against Leesburg Fairfield. Wheelersburg’s Ellie Ruby catches a pass on Wednesday evening against Leesburg Fairfield. Wheelersburg’s Abbie Kallner shoots a jumper on Wednesday evening against Leesburg Fairfield. LUCASVILLE — When a team is involved and engaged in its pressure defense, the results usually tend to be fruitful for the said unit in question. That definition certainly couldn’t have borne much more fruit than it did for the Wheelersburg Pirates’ girls basketball program on Wednesday evening as Wheelersburg accumulated 27 steals, had six players score at least six points or more, and scored the first 37 points of a Division III Sectional Semifinal matchup against the Eastern Eagles’ girls basketball program en route to obtaining a massive 66-6 victory over the Eastern Eagles’ girls basketball program in a contest that was played at Valley High School in Lucasville on Wednesday evening. 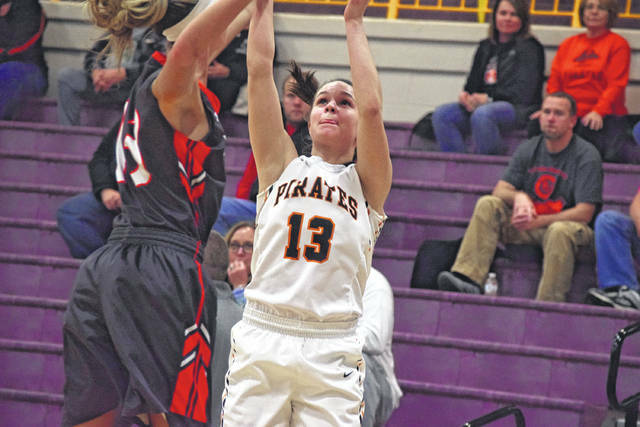 For Dusty Spradlin, the veteran head coach couldn’t have asked for much more out of his unit than the performance that the Lady Pirates ultimately put together on Wednesday. The Lady Pirates, who entered the contest with an impressive 16-5 overall record coming in despite the loss of All-District honorees Makayla Akers and Kalle Coleman from the year prior, wasted no time finalizing the contest before it even began as Wheelersburg ultimately scored seven points over the contest’s first 1:03 to take control. That lead, however, didn’t quit growing. 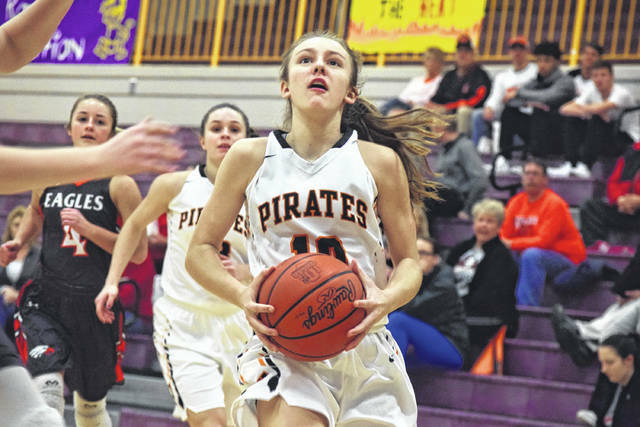 In fact, the Lady Pirates quickly extended to a 13-0 tally as Wheelersburg forced an amazing seven steals over the first 3:01 of the contest en route to obtaining easy baskets out in transition. Ellie Ruby, Mallory Bergan, Kaylee Darnell, and Abbie Kallner caused much of the issues as Bergan’s length blended in well with the quickness that Darnell, Kallner, and Ruby provided from their guard positions. The result? 16 steals in the opening quarter of play. 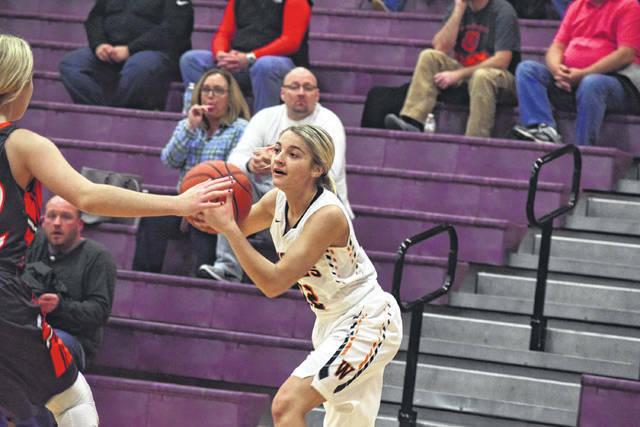 During the Lady Pirates’ impressive defensive display, Wheelersburg’s Kaylee Darnell and Abbie Kallner took control as the duo ultimately combined to score 16 of the contest’s first 22 points while maintaining the same intensity on the defensive end as Wheelersburg ultimately took a 26-0 first-quarter advantage. In the second quarter of action, Leann Spradlin and Bella Williams got going as the former used her crafty slashing and shooting abilities to obtain five of her eight points in the quarter. When Spradlin — the last of the starting five still out on the floor — exited the contest with five minutes to play, Williams entered the affair and added four points on a pair of low-post baskets. During that period of time, Eastern’s Tiffany Burkitt finally got the Lady Eagles on the board with 1:01 to play in the opening half to end a 14:58 scoring drought for the Lady Eagles, but by that time, the game was a mere formality as the Lady Pirates held a 39-2 halftime lead. With its halftime advantage at the previously mentioned 39-2 gap, the Lady Pirates allowed a half-opening bucket, then jetted out on a sizeable 14-0 margin as Kallner and Darnell combined for 12 points during the spurt before the starters were removed with four minutes to go in the third quarter. Even with its bench emptied, Wheelersburg ultimately increased its lead all the way to the aforementioned 66-6 final. For the contest, Kallner ultimately finished with a game-high 15 points while Darnell added a dozen to head the charge for Wheelersburg — doing so in approximately 11 minutes of action. Leann Spradlin and Bella Williams combined for eight points apiece, Kallner’s younger sister, Ellie, obtained seven points during the affair, and Mallory Bergan added six points on her own accord. Addi Collins’ four points, along with two points each from Ellie Ruby, Lani Irwin, and Paige Emnett, rounded out the scoring. Burkitt’s four points led Eastern. With the victory, Wheelersburg (17-5) will take on No. 5-seeded Leesburg Fairfield on Saturday afternoon at 2:45 p.m. in a Division III Sectional Final that will be played in Lucasville. Spradlin says that the Lady Lions are certainly not a team to be taken lightly, especially with star hand Grace Shope (21.5 points per game), who can play all five positions on the floor — and is a 1,500-point scorer — available for Leesburg-Fairfield (17-5).